Round 2 of the 2018 - 2019 Northern Night Cup. Parking on Deshar Road (north side) between the entrances to Grampian Crescent. 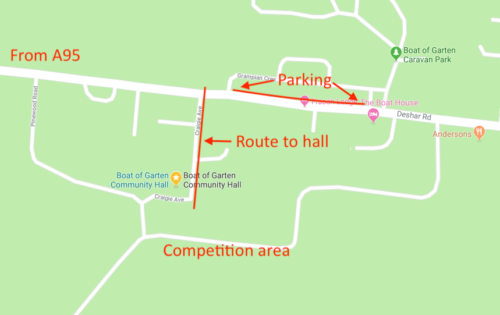 Maximum distance to Boat of Garten Community Hall is 250m. You will be able to leave bags in the hall where there are also toilets. A classic runnable Strathspey area with excellent contour detail, especially on the wooded slopes of the hill SW of Boat of Garten. The flatter, more subtle areas will prove to be challenging at night - compass and distance judgement skills will be tested! There are lots of unmarked extraction lanes in the woods, particularly surrounding the furthest away controls on the long. 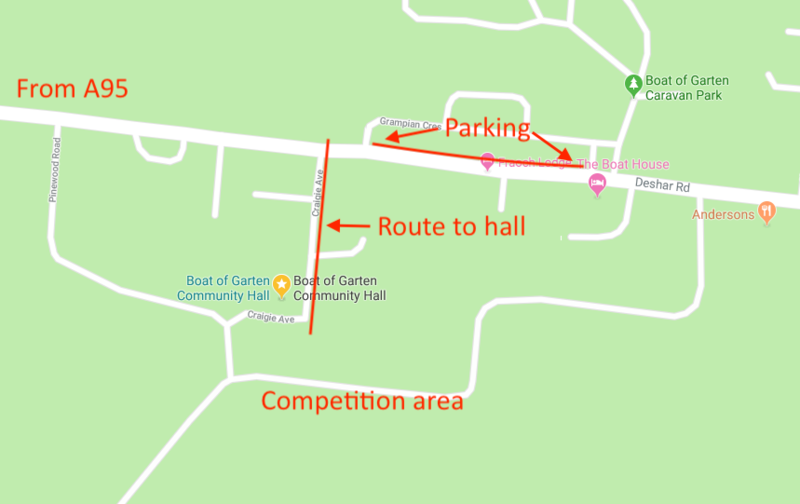 Registration, Map issue for ALL COURSES, Entry on the Night, Download and SI dibber collection - Boat of Garten Community Hall, please use entrance at left hand side (east side) of building. No dobs or muddy shoes inside. 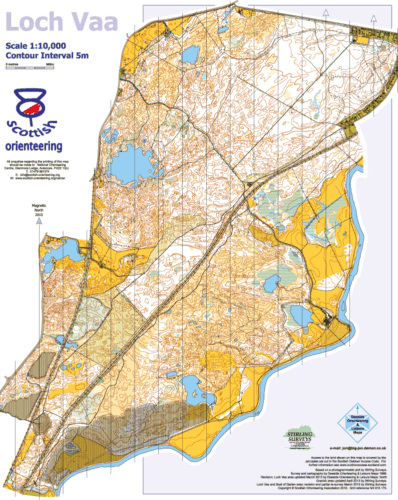 Start: 6pm to 7pm; 800m along a taped route on a flat path from Registration. Finish: adjacent to Community Hall. Courses close 8pm. You must report to Download in the Community Hall even if you do not complete your course. Short = 2.5km, 70m climb, 9 controls. All course details are subject to final controlling. Enter online through SIEntries. Online entries close Monday 10th December 2018. Entry on the night will be available, but map numbers will be limited, so please enter online. This will make it much easier for event organisers! , giving details (name of entrant, club, age class, SI dibber or hire one). The course is relatively contained and so is suitable for beginners, less confident night-orienteers and younger juniors. On leads outside; no dogs inside the hall. Soup & bread £1 minimum donation. Alba Chocolate will also be selling, more details to follow. Tea & coffee available for a donation. Toilets in the Community Hall. We strongly recommend carrying a spare head torch, as having a torch failure with no backup makes it hugely difficult to complete the course, and it can ultimately be challenging to find the finish! Whistles are also recommended, but are not compulsory. Please come prepared for winter Speyside conditions! The area is contained by many large paths/fences/roads, meaning getting completely lost would be a challenge! 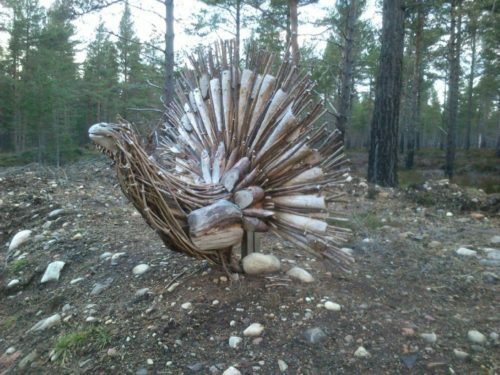 However, the safety bearing is NE. Please ensure that you have read the Northern Night Cup 2018/2019 Guidelines, Rules and Scoring and if appropriate are familiar with the Shadowing and Juniors Guidelines published there.